America’s powerful patriot battles energy wasters and teaches us how to keep the power flowing long into the future! Comics teach us many valuable lessons, such as how underwear looks better on the outside and that radiation exposure is a sure-fire way to gain super powers. When it comes to solving the energy crisis, however, there’s only one hero who can fill up a bread bowl of patriotism with a red, white and blue grilled cheese on the side! 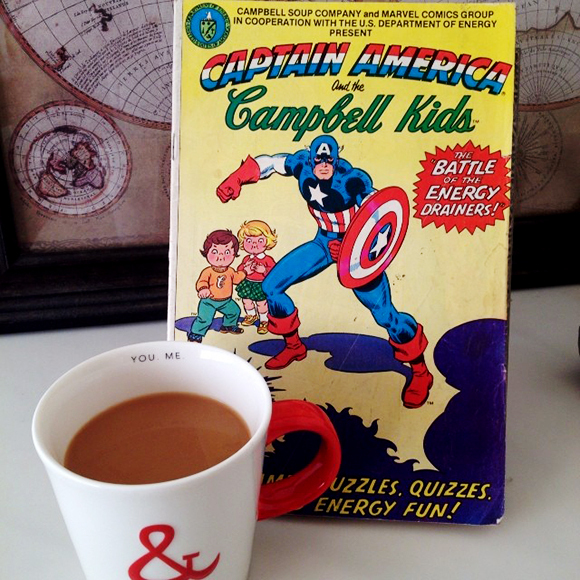 Captain America and the Campbell Kids is brought to us by the Campbell Soup Company and Marvel Comics Group in cooperation with the U.S. Department of Energy in the crossover event of the decade (even hotter than the time Superman teamed up with the Quik Rabbit!). When ol’ Winghead takes time off from his duties as an Avenger and defender of Old Glory, he spends his days partnering up with toddlers of the pinched-cheek variety to bring us a lesson on saving energy hidden within all the joy and merriment of a comic book adventure. The Campbell Kids were a pair of children sporting the rosiest of cheeks created by Grace Wiederseim (also known as Grace Drayton and Grace Gebbie), a cartoonist and illustrator who designed them for marketing by the Campbell Soup Company. I’m willing to bet, true believers, that she never dreamed that her beloved characters would someday team up with the Sentinel of Liberty to participate in “The Battle of the Energy Drainers”! Fortunately for a quartet of middle school students, their guide to the Energy Museum at the time of the big science fair is none other that the Living Legend himself, Captain America. A group of big brains who are exceptionally proud of their scientific creations, we get to meet a blonde-haired boy named “Soapbox”, an Asian-American girl named “Clean Clara”, a brown-haired and bespectacled boy named “Reading Ricardo” and an African-American girl named “TV Tanya”. Soapbox has created gas-powered soapbox derby cars, Clean Clara invented electric conveniences for bathroom grooming, Reading Ricardo designed robots and lighting systems to maximize the ease of a reader’s life, and TV Tanya devised a system to watch programs, play video games and run computer applications all at once. Cap is stunned to learn how casually these children are wasting energy with their clever contraptions, so he decides that it’s time to show them the future of energy! After passing through the oil well, hydro-power, solar-power and nuclear power exhibits, Cap introduces the children to the examples of future energy production. These include the geothermal and synthetic fuel exhibits, but the kids don’t get very far in their introduction when “the sound of eerie laughter” (as narrated by The Campbell Kids) draws the party back into the main exhibit hall. In there, a hulking masked man wearing red-and-orange gear with a head full of flaming hair is boasting from the top of the hydroelectric exhibit. Thanks to The Campbell Kids, we quickly learn that “the villain uses his powers to drain energy and heat from the exhbits, the visitors, even from the sunlight itself!”. The “Thermal Thief”, as he comes to be known, takes energy from all around him, freezing the water in the hydroelectric exhibit and chilling the blood of all onlookers. Cap summons the strength to climb up the exhibit and take down the Thermal Thief, but then he is suddenly attacked by the villain’s cohorts, the Wattage Waster and the Doomsday Man. The Waster drains all the electrical sources of their energy to use for her own means while the Doomsday man drains the energy from all around him, including directly from human beings! As Cap lies helpless between his attackers, Soapbox grabs his science exhibit – the soapbox derby car – and sends it careening into the geothermal exhibit, sending steam toward the bad guys and giving Cap cover from which to escape their evil clutches. As Cap finds some breathing room to recover his energy, the bad guys also escape into another area of the Energy Museum to hatch their schemes. In the meanwhile, Cap alerts the children that the key to defeating the Energy Drainers is in their hands. It’s up to them to figure out how everyday household tasks can be made to save valuable energy. Ignoring the fact that super-villains are running amok, Cap and his young wards scamper into the home exibit, where Clean Clara learns how morning routines can use less hot water and electricity, Reading Ricardo sees just how much energy is wasted by robots bringing him his books, TV Tanya discovers just how much energy is wasted by running so many devices at once, and Soapbox sees how pedal locomotion will build his muscles while reducing energy consumption. And with today’s lessons now complete, the children are ready to stop the Energy Drainers cold “by becoming Energy-Savers instead of Energy-Wasters!”. And with the Campbell Kids looking on in narration, Cap sets off to find the Energy Drainers and foil their evil plot to steal the world’s energy! And so begins a pitched battle as Cap finds the first of his enemies in the wind power exhibit, but the Thermal Thief is no match for the agility of Captain America. The Wattage Waster then gets the upper hand on Cap in the recycling exhibit, but his legendary shield keeps her electrical powers at bay long enough for Cap to carry her out with the trash. All hope is lost, however, when the Doomsday Man traps Cap within an energy-siphoning disc which spells doom for not only America’s greatest hero, but also the world’s energy sources! Only the children can possibly stand in his way by shutting down all the exhibits one at a time, at great personal risk, as the Doomsday Man vows to make them suffer for their interference (much to the consternation of the Campbell Kids, still narrating overhead). With his sources of energy being cut off one after another, the leader of the Energy Drainers becomes desperate, blasting the pedal-powered derby car just as Soapbox leaps from the driver’s seat. With one final lunge, Soapbox pulls the shade cord for the overhead windows, cutting off the Doomsday Man’s last source of energy – sunlight! As the Doomsday Man meets his doom, losing all his stolen energy and losing cohesion of his own body, he turns into a mist and disappears from sight. Cap gives all the credit to the kids, of course, as they all celebrate the victory. Energy conservation wins the day and adds up to a brighter future for everyone! The cover of this book is worth the back issue price alone. It’s not complex, dynamic or artistically exceptional, but makes me giggle like few comic book covers can do. While Cap is shown ready as always to face the mysterious Energy Drainers, the Campbell Kids stand at his side – a boy and girl, two siblings – with the boy pressing his sister back out of harms way as though he’s ready to duke it out with the bad guys alongside Cap. Between each chapter throughout the comic, there are word games, mazes and puzzles, as well as one-page comics (á la Hostess Fruit Pie advertisements) providing energy-saving lessons and home experiments. With each exercise and activity, the reader earns “points” which can earn them their very own “Energy Diploma”. When you get to the end of the comic, there is a form to fill out and mail, in which case the U.S. Department of Energy would send out an authentic diploma “for being a super energy-saver … and expanding the American horizon” signed by none other than Captain America himself. It doesn’t really matter how well you do in the activities, true believers, because learning about energy conservation is the most worthwhile of all adventures, and you’ll get your own diploma to keep the Energy Drainers forever at bay. Fare Thee Well! Captain America and the Campbell Kids is written by Bill Mantlo, illustrated by Al Kupperberg, Herb Trimpe and Dan Green, lettered by Irv Watanabe and colored by Carl Gifford.